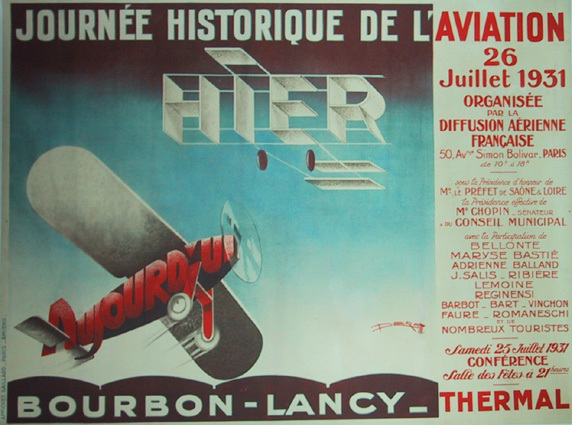 In 1931, the composition in the foreground Aujourd’hui was very today (while the white, biplane figure was very yesterday). Time flies. 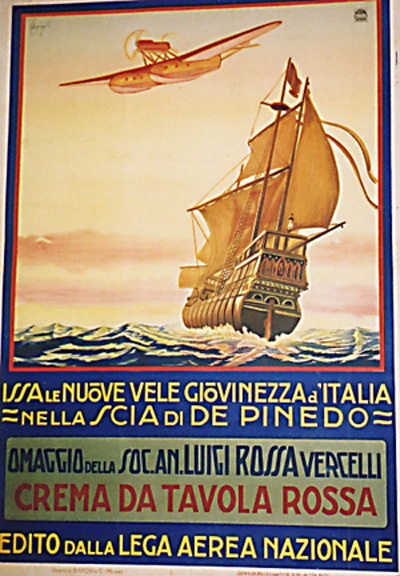 But the mystery and romance of people travelling in the air remains a constant treasure of the modern era. Here’s another whimsical comparison, endowed with graphic punch. 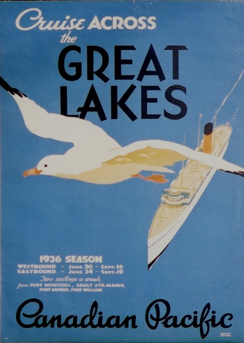 As the design of the crafts became more devoted to creature comforts, the whole experience of flight, as rendered and promoted by graphic art, added on chic to its initial strong suit of awe. 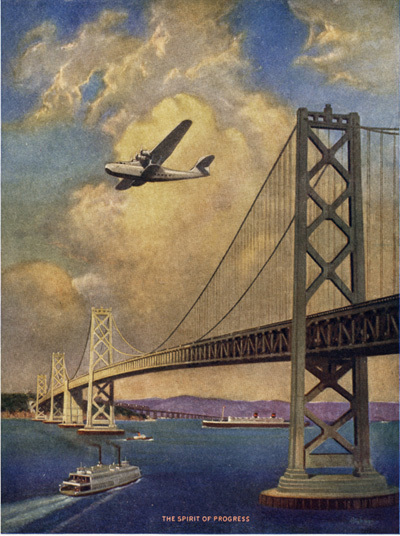 With the art deco monument that is the Golden Gate Bridge laying down a baseline of serene modernity, an iconic, palm-zone clipper displays its touch of heaven, en route to a haven like Hawaii. 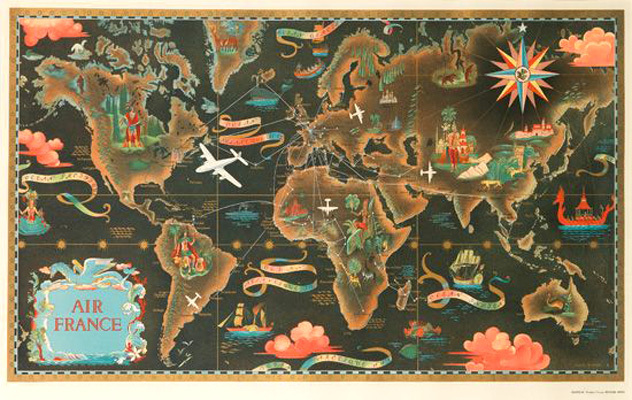 This graphic vividly demonstrates how the gratifications of global air travel dovetail with a world of alert, gracious hospitality. 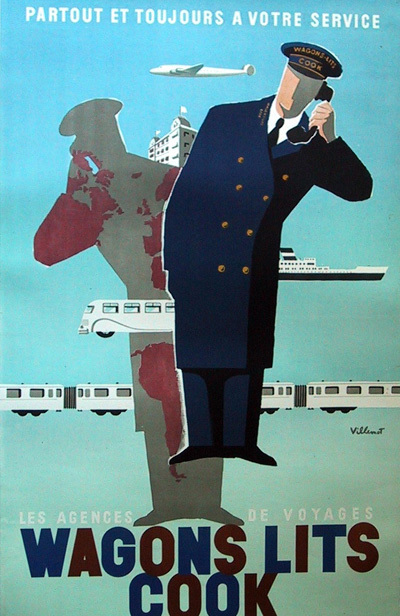 The two concierge instantly span the globe with their telephone communications; and the airliner promises a steady reduction of the time required to go from one metropolis to another. 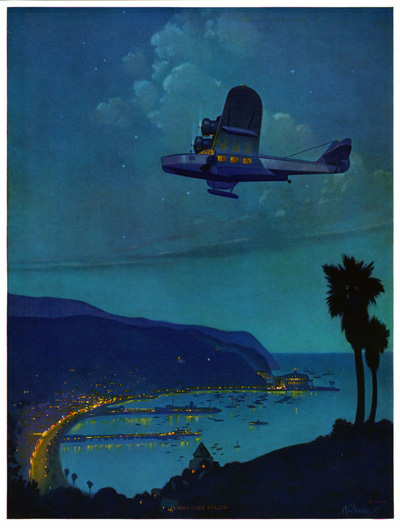 One of the instances of the great Air France map posters by Lucien Boucher, evoking the salubrious lighting and the dazzling history of ports of call. 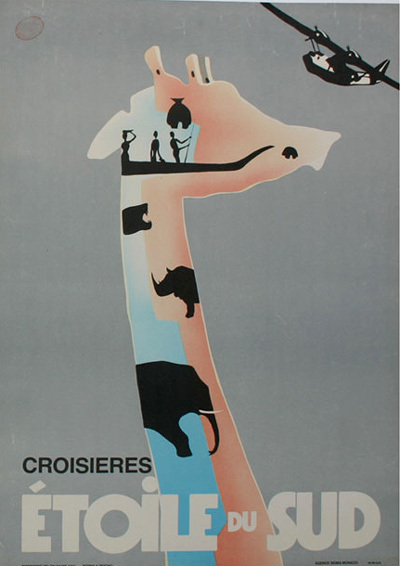 I love how the primitive powers in vignette form along the giraffes long neck make common cause with that dashing Clipper lending its majesty to the Dark Continent. 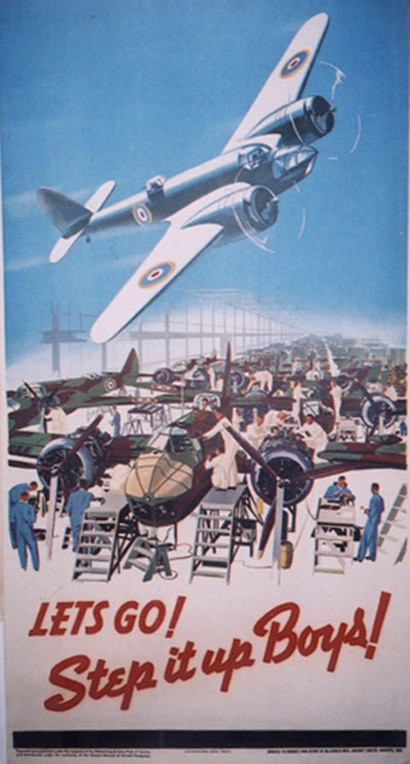 War-plane graphics tend to bring power to the fore and majesty to an auxiliary level. 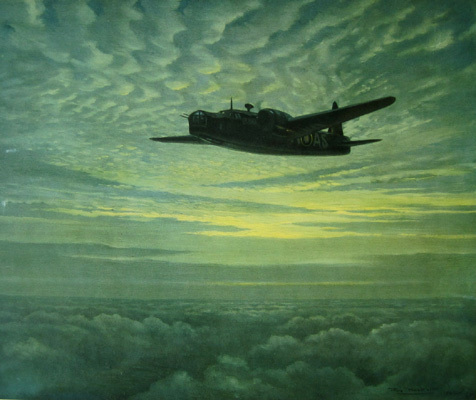 Here’s an exception in military aviation art, with mystery to the forefront. 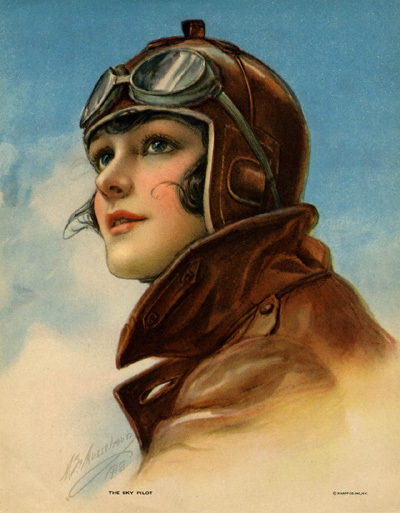 There is a sub-genre of promoting women aviators in order to install a more down-to-earth charm within the awesome phenomena. 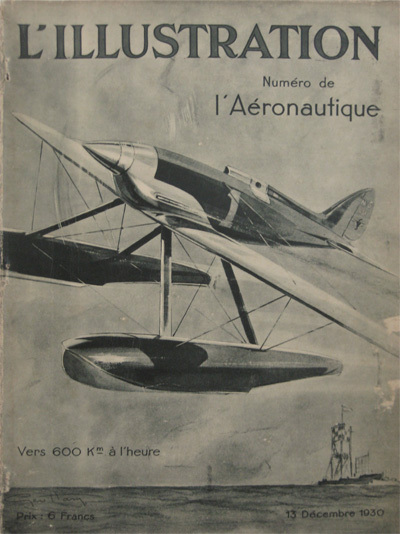 This pair of graphics devoted to aviation panache reminds us that the subject was extensively covered by the graphics of the burgeoning magazine medium. 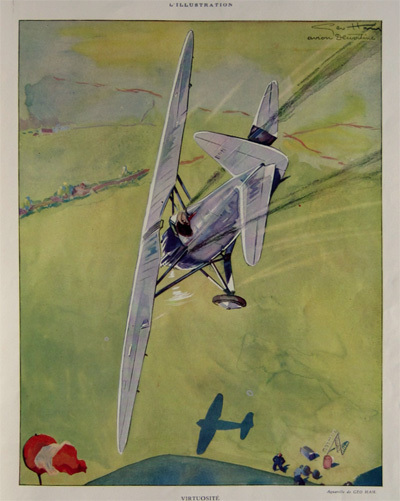 This entry was posted in Art Deco Posters&Graphics, Illustration Art, Illustrators, Modernist Posters&Graphics, Poster&Graphic Art, Poster&Graphic Artists and tagged Benny & Peigno, Bernard Villemot, Geo Ham, Illustrated vintage magazines, Lucien Boucher, Ruehl Heckman, vintage artistic magazine, vintage aviation posters, Vintage Transportation Posters. Bookmark the permalink.